Why does the Epping Chatwood section need any changes? To accomodate 1300 passengers, 100 more than double deck stock, the “metro” cars will need to be the same width as current wide bodied stock. There is no reason that the platform height cannot be the same and any worry about collecting traction current can easily be handled by a longer travel pantograph just as it was on our original single deck stock. So what I am saying is it is quite easy to design the stock to fit the existing line. As for the Northern line, ARTC will soon (and likely before the newly planned Metro) provide a 3rd track between Epping and Thornleigh. Some funding from the state could easily see it extended to Hornsby. Bi direction signalling will allow extra peak direction expresses. 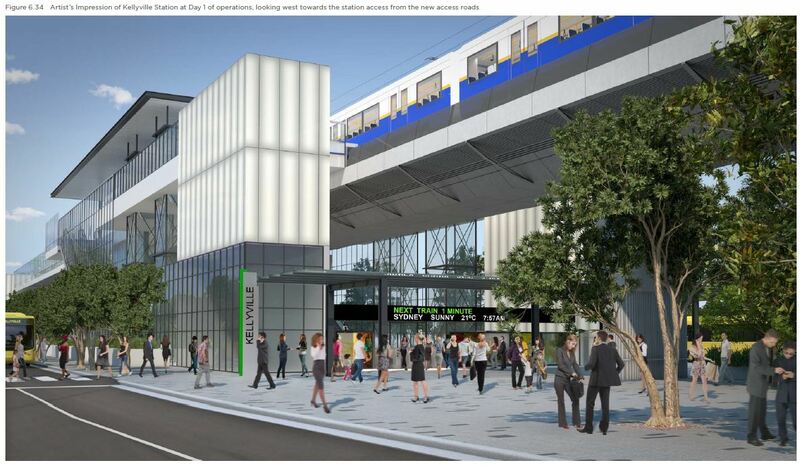 So all will be well except that many of the patrons on the new metro will be expected to STAND in order to obtain the loading figures quoted. Bi-directional use of the Northern Sydney Freight Line could certainly provide the required capacity boost. However it still doesn’t explain why this is missing from either the NWRL or Sydney Rail Futures documents. Perhaps the ECRL modifications are because the NWRL tunnels will be narrower and thus have lower overhead wires, requiring the overhead wires in the ECRL to be lowered also. Or perhaps it could be to allow for driverless trains. Though I can’t say I find either of those theories convincing, so the question remains out there. I wonder what they are doing with the NWRL to get higher speeds. If so, where does this leave the ECRL with top speeds (I think) of 80Km/hr? (The ECRL *feels* slow to travel on it). I went looking for how the physical characteristics of tunnels affects designed speed and came up with blank.. is this a black art? Give a Rouse Hill to Chatswood time of 37 minutes, doesn’t this mean a total journey time to Town Hall of just over an hour? So, better than a car in peak periods, but worse at other times. For me the planners are still flirting with the upper threshold of what people will put up with when confined to a train. Which takes me back to the original question. Are there design parameters that relate physical tunnel characteristics to speed? If so, what would it have taken to get the peak speed up to 120Km/hr and thus take 10 or more minutes off the journey? I’d always hoped that the NWRL would be a shining example of how to wean people off cars. But speed does matter. I’m also worried that they’ve underestimated the need for car parking. Most people on the Northern Line use the train to get to Macquarie Park, Mac Uni, North Ryde, Chatswood, North Sydney and Wynyard so they will all need to change at Epping – the worst ever place to try and change trains with several banks of steep, extensive escalators (and then again at Chatswood if needed). They paid and sacrificed a lot to make a conscious decision to live on a direct route close to work and the anger out here is the worst I’ve ever seen. Many people that use the trains who are not working are elderly and not as mobile or have no licence due to advanced age or are parents of small children.How is this progress?? ?